I’m sure most of you have heard of Twitter by now. You may not be on it, you may not understand it, but you’ve at least heard about the ubiquitous microblogging site. Well, Lauri Apple and Seth Gershberg with the Chicago Art Department have heard about Twitter, and they have decided to see what it is made of by conducting a social experiment. Twitter Island, which will be held today from 1-3 at the Chicago Art Department (1837 S. Halsted), plans to bring together 30 volunteers for a “social networking experiment and art performance piece.” Essentially the volunteers will be split into two groups: one will be given prompts by a moderator and encouraged to tweet about those prompts, while the second group will be allowed to tweet without boundaries. Will the control group rebel and tweet off-prompt? Will the tweets turn into shameless self-promotion or will the idea of community win out? Can this online social networking platform be used to create art? I spoke with Lauri and Seth to ask these questions and more. Museumist: How did you come up with the idea to used a social media platform like Twitter for creating art? Lauri: I’m a community manager at a Chicago-based website, and have also worked at start-ups. Social networking has become more and more a part of every job I have/do. So there’s that. Also, it doesn’t seem like many artists are exploring social networking as a subject or medium yet, so we’re taking advantage of that. 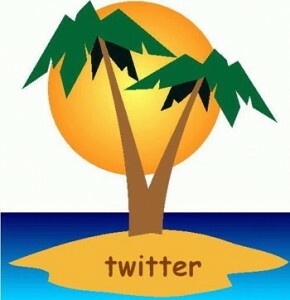 Museumist: Is Twitter Island art? Or rather, how do you view the differences between social experiments and art? Is there a difference? Lauri: The actual event is not art per se, I don’t think. The art will come out of the results — we’ll ask people to make art based on their Twitter conversations, and we’ll also try to make art from the experience. The art can be a poem, a sketch, a painting — whatever people feel comfortable doing. Re: Social experiments and art questions: Sure there’s a difference. Communism in Eastern Europe and Russia, and the creation of housing projects, were both decades-long social experiments, but I wouldn’t call them art. Museumist: What do you think will happen? What is your ideal outcome? How will you judge success or failure? Lauri: I think/hope that some lively conversations will result, that people will think about new ways to use Twitter, and realize how they are creative (if they’re not already full-time creative types). The ideal outcome is that everyone has fun, learns more about themselves, and then feels enthusiastic about creating something more based on their experience. As for failure, I think the only way this will fail is if the server konks out or if nobody shows up. Museumist: What can galleries and museums learn from the Twitter Island project? Lauri: Maybe that you can use these social networking tools to get people to come to your museums and galleries and use them to get people to think about art and creativity. Museumist: Is there an incentive structure for people in the “control group” to stay on task? Seth: No, we want to put as little restrictions as possible so as to observe human nature. We will have some rules, but we will not enforce them. Museumist: Do you think that lots of rules and guidelines are good or bad for online communities? Seth: IMHO they are very bad. Rules curtail freedom and creativity. I believe there is an inverse relationship between rules and revenue opportunities. The mnore you restrict activity the more you restrict income. Should they be allowed to self-regulate? To some degree – online communities should police for child predators and criminal activities – in other words they should provide a safe environment. Museumist: How have Twitter and other social media platforms affected artists? Seth: Exposure, networking, promotion, direct contact with fans. Museumist: Where, when, and how will the results of the project be put on display? Seth: Results will be organized into at least two art projects that will be shown at CAD www.chicagoartdepartment.org and Rooms (another gallery in Pilsen, Chicago). Museumist: Are you on Twitter? Care to share your Twitter names?